After Thanksgiving, holiday shopping is in full swing, and it’s the busiest time of year for the retail industry. For small businesses, the post-Thanksgiving weekend can be particularly important. Small Business Saturday (Nov. 24, 2018) encourages consumers to shop local and is a great opportunity for small retailers to increase their profits for the year. Founded by American Express in 2010, this annual shopping day supports independently owned businesses that create jobs and make local economies thrive. “Our ultimate goal is to help small businesses do more business, and for Small Business Saturday, that includes arming them with the tools to help make the day a success,” said Amy Marino, vice president and head of Small Business Saturday at American Express. To help small business owners, American Express offers free business boot camps, online “SBS 101” education content, and customizable print and digital signage. Items such as event flyers, posters, save the dates, and social media assets are available for business owners to customize and download for free to promote their business (now available in Spanish). Below are some tips to help make Small Business Saturday a success for you. Embrace Small Business Saturday. “This is one day out of the year where you can tell your story and harness the publicity that naturally surrounds the day,” said Brian Mattingly, CEO and founder of Welcomemat Services. Embrace the day by doing something unique and tell your existing customers about the day through email, mail, and social media. Treat it as the beginning of your year. The start of the calendar year is a hectic time for small businesses. Use Small Business Saturday as an early opportunity to assess the state of your business, said Kevin Miller, chief marketing officer at Neat. Do you need to hire seasonal help? Is there new technology you can implement to streamline specific business workflows? Use Small Business Saturday to complete a holistic assessment of your business operations, Miller said. Stock up on potentially popular items. The last thing you’ll want is to run out of your most popular merchandise before the season is over. That’s why it’s critical to understand your product or service demands during the holiday season, said David Gilbert, CEO of small business lender National Funding. Plan strategically in advance, he said, and stock up on popular items. Offer special discounts and offers. Like Black Friday and Cyber Monday, Small Business Saturday is a great day to offer special deals to entice customers. A 2016 survey by Infusionsoft and Pollfish.com found that the most popular Small Business Saturday promotions in 2015 were limited time offers (24 percent), free gift offers (21 percent), coupon discounts (20 percent) and buy one, get one free offers (19 percent). Reinvest in social media. When your small business gets busy, social media is often the first thing to get pushed aside. But it should be critical part of your marketing plan. Mattingly suggests creating a story on social media with pictures that speak to the purpose of your business. “Creative and purposeful content can capture the attention of consumers, which, in turn, creates shares and engagement,” he told Business News Daily. Boost your other marketing strategies. Aside from social media, take the time to rethink your marketing strategy and increase your advertising plans, said Gilbert. He recommends that business owners create a comprehensive marketing campaign that will draw customers to their store. For more tips on creating a great holiday season marketing plan, read this Business News Daily article. Saige Driver graduated from Ball State University in 2015 with a degree in journalism. She started her career at a radio station in Indiana and is currently the social media strategist at Business News Daily. She loves reading and her beagle mix, Millie. Reach her by email, or follow her on Twitter. Additional reporting by Brittney Morgan and Jennifer Post. Some source interviews were conducted for a previous version of this article. Click here for the original article on Business News Daily. The holiday season is quickly approaching, and the time is now to make sure you get the most of your marketing efforts to help secure sales success in the coming months. Here are a few budget-friendly ideas to help get you started. If your small business has a social media presence, contests on Facebook and Twitter are often a popular way highlight your brand and engage with customers, reminding them that your product or service is available – and a potentially great gift idea. With a few rules, a clever hashtag and incentive such as a prize or discount on your offerings, you can drum up excitement about – and draw people in to – your business. Take this time to make your loyal customers feel extra special – it may come back to you by way of additional business and referrals. Without breaking the bank, you can provide special offers, sneak previews, free shipping or secret sales. Make your small business stand out by hosting an open house or special event at your store or restaurant. Use it to showcase holiday season gifts, menus and merchandise so customers can get a glimpse of your seasonal goods in advance. Pair the browsing with light refreshments – a mug of hot cocoa or a glass of cider – to get people in the holiday spirit. On their way out, give a special offer or coupon that invites customers back to make their purchases at a discount. This is a great idea from Illana Bercovitz at Small Business Trends: use social media to offer helpful tips during a stressful holiday season. Consider your industry, product or service and related advice you could offer to make customers’ lives easier. “Everyone appreciates useful advice and your customers will thank you for pushing content that makes their holidays slightly less stressful,” Bercovitz says. Use an original hashtag to maintain brand awareness across platforms such as Twitter and Facebook. Although it’s often considered overused, email remains inexpensive and easy to implement when it comes to maintaining contact with existing customers. That’s a key to remember – to be effective, email marketing should be used with folks you have already done business with or who have expressed an interest in your business and have requested email from you (otherwise known as permission marketing). Keep the e-mail short and sweet. Link directly to the content of interest so you make the process as easy as possible for your customers. Be festive in your design. Appeal to the sights of the season with a special design for the holidays. Follow online marketing rules. Don’t forget that online marketing is regulated, so whatever tactics you employ be sure to follow government guidelines that apply to list management, SPAM and other guidelines. I am an author and moderator for the the SBA.gov Community. I’ll share useful information for your entrepreneurial endeavors and help point you in the right direction to find other resources for your small business needs. Thanks for joining our online community here at SBA.gov! The holiday season is upon us and with that comes the opportunity to support your local businesses as you shop. Here are just a few ways you can shop local. Communities thrive when small businesses succeed. Presented every year by American Express, Small Business Saturday follows Thanksgiving on Saturday, November 28. Support your fellow Chamber members on this Saturday by shopping local. Whether you’re downtown or searching around the many shopping plazas in Sarasota, there are plenty of small businesses to be found. Find local Chamber member retailers by visiting our online directory. You can view the directory on our website on your mobile device. Search for local retailers in the “Shopping and Specialty Retail” section to find the right shopping destination for your holiday shopping list. Before you wait in line on Black Friday or add items to your cart on Cyber Monday, don’t forget to check out the discounts and holiday specials your fellow Chamber members are offering this season. Visit the Coupons and Discounts section of The Chamber website to view the available offers by our members for our members. When you buy local, you buy Chamber. 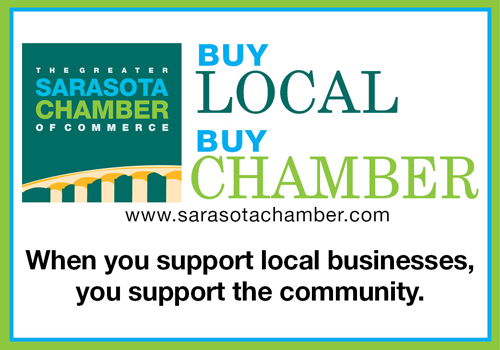 When you buy Chamber, you support the flourishing small businesses that keep our community afloat. We hope you’ll join the celebration of small businesses nationwide for Small Business Saturday on Saturday, November 28.